I am still amazed how the most simplest of things can give so much fun... like bubbles, balloons, big boxes... and paper & sticky tape. 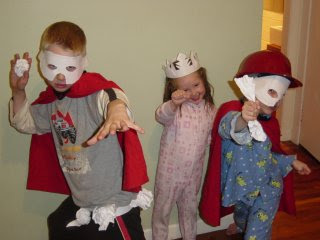 For some strange reason last night, right before bed, the kids decided to make superhero masks (and a princess crown) out of paper and tape... (big ups to Nana for her much needed creative input while visiting). Cool! 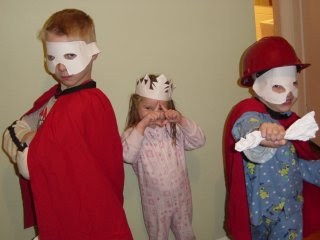 The simple stuff is great- my kids play "recycling" which involves walking around with cardboard boxes and filling them with random bits of paper. Crazy stuff! Haha...cool! J-Boy knocks out the enemy with trash thrown at 500 times the speed of light!! !